D-Link Omna vs. Logitech Logi Circle: Which home security camera to keep? I didn’t intend to do a comparison piece between the D-Link Omna and Logitech Logi Circle, but here I am, with both in my house, and I only need one. One has to go. But which is it? First: Let’s talk about my needs. I’m really only looking for something to check in on my kids during the day. I want something more full-featured than a baby monitor, but it doesn’t need to be a full-fledged security cam (which I already have through my security company). I’m looking for something in between. The Omna in all its glory. Because it’s not cloud-enabled, there’s no need for a subscription to unlock core features. What you see if what you get. Zone motion detection? Check. Notifications when activity is caught on camera? Check. Ability to look at past events? Check. The only limitation to how much it can record is the size of the microSD card you put into it (which is an additional, albeit only one time, purchase, of course). Above you can see the motion settings. You pick the zone. You pick the sensitivity. You pick how often it triggers (i.e. if it senses motion twice or more in a given amount of time, it only sends one notification). Nice benefit: Even if your home internet goes down, the camera will still keep on recording when it senses motion. Potential drawback: In only records in 20 second increments (the 20 seconds immediately following when it first senses motion). The feature I love the most (and the main reason why I bought it)? Once it’s set-up, you don’t need the dedicated Omna app anymore…if you’re an Apple user. You can just use Apple’s Home app — the same app I use to control my Hue lights. The ability to see my room specific lights, cameras, and other smart home devices on one screen is SUPER convenient. It also makes sharing with other people in the household a breeze. Once I set it up on my phone (which is done in 3 easy steps), the new camera automatically appeared on my wife’s Home app. Didn’t have to do anything at all on her phone. So as you can tell, I bought the Omna. I set it up. And I was happy…until I went to Best Buy to get a microSD card and saw that the Logi Circle had just gone on sale. Two days ago, the Logi Circle and the Omna were the same price — $200, which is why I went with the HomeKit-enabled Omna over the Logi Circle, despite it’s great write-up at thewirecutter.com (where tech reviewers go for reviews). But as of this writing, the Logi Circle is now only $130. That’s $70 in savings. With the Omna still in its return period, I had to check out the Logi Circle. Both have the same basic (and free) functions: A live view of any room in your house and the ability to record motion-triggered events. The Logi Circle has no local storage, though, so you’re dependent on Logitech’s cloud-based hosting of your video. At the free tier, you get a 24-hour recording archive. NOTE: That’s not 24 hours OF recordings. Just recordings FROM the last 24 hours. Like the Omna, the Logi Circle only records in snippets, based on when the motion sensor is first triggered. Unlike the Omna, the snippets vary in time and can go well-over 20 seconds. Possible detriment: If you put the camera in a place with a lot of activity, that’s a lot of video uploading. It could tax the speed of your home network a bit. But the cloud-service (even at the free level) does come with a perk: You can view a special time-lapse video (30 seconds in length) of all the activity over the previous 24 hours. And you have the option to pay $4 or $10/month for a 14-day or 31-day recording window. The $10/month option also unlocks the ability to record by zones (something free on the Omna), as well as some other features — like the ability to tell when a “person” triggers the motion sensor instead of an animal or the wind or something. So that’s how they are the largely the same at the free level. But how are they different? The Logi Circle is vastly more customizable. You can choose another resolution if the 1080p setting uses up too much data (either uploading or downloading on your mobile device while on the go. The ability to set up motion zones might be extra, but the Logi Circle has some free “alert” settings missing from the Omna, like “smart location” which checks to see if you (i.e. your phone) is home. It also has more generous delay times, up to 30m, which can keep your phone from getting cluttered with notifications for the same activity. 2. If your internet goes down, so does your ability to record anything on the Logi Circle. Not a problem with the Omna. 3. Degree of visibility and video quality. Both offer HD imaging, but not all HD is the same. Blurry pixels in HD are still blurry pixels. Also: The Omna has a much wider degree of visibility. The Logi Circle’s 135 degrees of visibility. The Omna is 180. Note: Both pics were taken from the same exact spot. 4. Night Vision. Both offer night vision. But the Logi Circle made a weird “click” noise whenever it enabled its night vision mode (i.e. anytime it senses motion in a dark environment, or you if you check-in for a live stream). I think that’s because the Circle senses for motion first (or waits to be contacted for a live stream), then looks for light, then enables the night vision mode if needed. The Omna senses its dark first and already has it’s night vision lights enabled (and ready) for when it senses motion. The click noise was definitely noticeable, and it draws attention to the camera. 5. As mentioned, the “alert” options are quite different. The Logi Circle’s added customizations results in much fewer notifications on my phone. 6. Apple Watch support! Because it’s HomeKit enabled, the Omna sends preview images to your Apple Watch whenever it senses motion. And you can also watch a (tiny) live stream of your home from your watch. The Logi Circle does none of the that. Even on your iPhone, you don’t even get a preview photo. 7. The Logi Circle has a battery! The Omna does not. The Omna is made to stay in one place. In fact, I tried moving to another room and had to set it up all over again (why? I’m thinking it’s because I have an eero system, and switching from one eero router to another changed the IP address assigned to the Omna, which confused it.) The Logi Circle can be taken off it’s dock (i.e. the permanent place in your house where it sits) and moved anywhere for up to a few hours. I had no issues moving it all over the house. Just know that the battery can drain quickly in a place with a lot of motion. (Putting it in battery saver mode turns off the motion sensor, saving energy because the camera only turns on for remote live viewing). 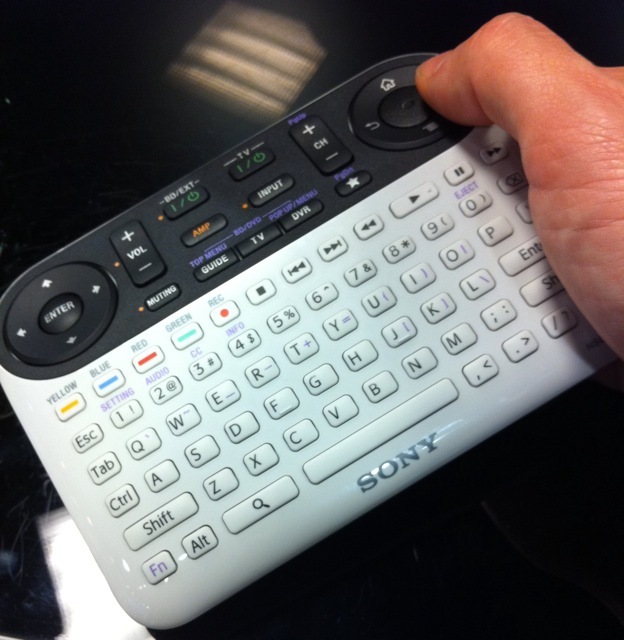 Sony’s Google TV remote is a handful. Literally. And not in a good way. I tried out Sony’s Google TV solution at a Sony store today. No, make that: I tried to try out Sony’s Google TV solution. I wanted to write a quick post today about my first thoughts on it, but I can’t, because I spent more time trying to figure out the darned remote than I did actually using it. The remote is a perfect example of “too much of a good thing.” 90% of the buttons are only needed very occasionally, which means for most basic tasks (like, say, watching TV) it’s just a lot of wasted and confusing space. And when you do need to use one of the extra buttons, it’s not-at-all obvious which button is the right one to press. I had to **gasp** ask a sales guy for help with something as simple as moving the cursor when using the Google TV web browser (the answer: the large round button on the upper right doubles as a mini touch-pad — cool, but not the least bit intuitive). I still want to try Google TV at home at some point, but based on my five minutes with Sony’s solution, I’m now leaning towards giving Logitech’s Google TV box a try. Its remote interface has to be better, right?